With Audulus, you can build synthesizers, design new sounds, or process audio. All with low latency real-time processing suitable for live performance. 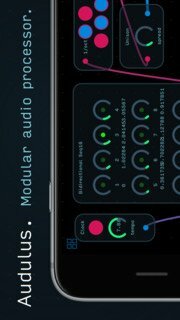 Audulus's user interface is clean, simple, and easy to learn, allowing you to focus on sound - now made easier than ever with nearly 100 built-in Eurorack-style modules. Rated "Killer App" on apps4idevices.com! â€¢ Custom Nodes - build your own modules! â€¢ Timing mode - figure out which nodes are using the most CPU! â–¶ Recommended hardware: 4th Generation iPad or later. iPhone 5 or later. Please don't hesitate to contact us at support at audulus dot com if you have any questions or need help.